Do you believe in a soulmate? Do you believe in love at first sight? No, we are not stimulating your dating profile, it’s just that whenever we talk about the two “ city of love” Mathura and Vrindavan, the essence of every soul becomes compassionate and romantic. This year drench your soul in the aroma of Love and Generosity which embarks a new life. 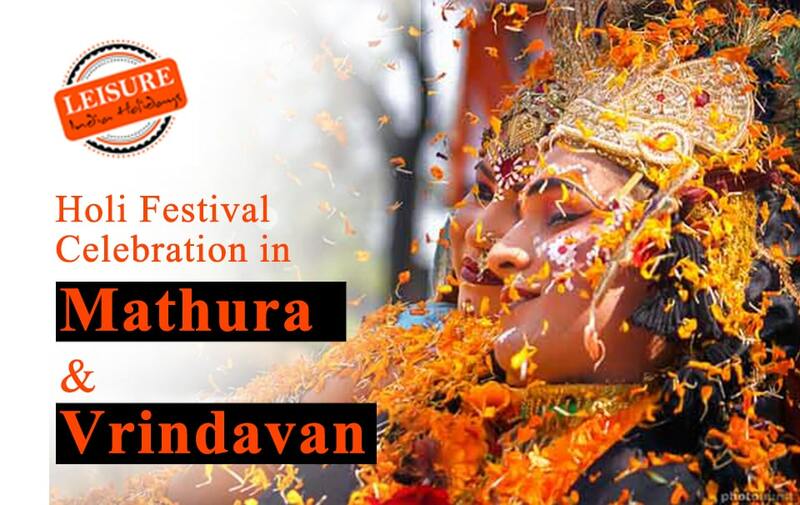 Plan a visit to the soulful, vibrant and charismatic venue for Holi celebration in Mathura and Vrindavan. India is a land of diversity, colors, and festivals. It has always been a wonderland of celebrations. Holi 2019 is approaching and what would be more wonderful than celebrating at the place where it all started. This two days festival symbolizes the triumph of good over evil and has an aim to spread happiness, colors, and brotherhood in your life. Vrindavan holds very significant importance in Hindu mythology. A city amidst Vrindavan forest(Vrinda means basil leaves) is the place where Lord Krishna has spent most of his childhood days. Also, located just 10 km away from Mathura(the birthplace of Lord Krishna), is sibling city to it. These two beautiful cities at the banks of holy river Yamuna are the epitome of love and beauty. Around Holi season these two places are filled with the incense of basil leaves, flowers, Yamuna banks, and Chandan. The alluring aroma assures you a Holi of a lifetime. There is always a mythological legend behind every Indian festival and so is the case with Holi festival. King Hiranyakashipu had a spell of being immortal. He couldn’t be killed by any man or animal, or during day or night, or on land or water. He was extremely proud due to this and excess of it ended him making cruel. His son worshipped Lord Vishnu and he hated it. To end the same, he ordered his sister (who also had a boon to not get burnt) to make Prahlada sit on his lap in a fire pyre. Holika had a special cloak to protect her from fire, but somehow it couldn’t save her. Since that day, people light bonfires to burn the evil energies and celebrate the triumph of good over bad. Also, the other mythological legend stated that Lord Krishna woes in front of his mother( Yashoda Maiyaa ) as Radha, his soulmate, constantly used to tease him for his dark complexion. Yashoda Maiya suggested playing with colors will help him to disguise in colors and will also make her one among them. From thereon Holi is considered as a festival of frolics ness and sweet mischievousness between love affairs. The other part of the tale where Krishna would play with Radha, her friends used to beat them with sticks is the origin of Lathmar Holi and Holi of Colours. Coming back to the celebration of Holi in Mathura and Vrindavan, these places are amongst the best places to celebrate Holi in India. Braj Bhoomi continues the celebration until Rangapanchami to appreciate the divine love of Radha and Krishna. Even the Bollywood movies have beautifully portrayed Holi khele raghubeera(click on the link to see a glimpse) Biraj me and you start imagining the same. When it’s come to Holi in Mathura, the famous attraction is the most playful types of Holi that are Lathmaar Holi or Barsana Holi which starts a week earlier than the actual Holi. 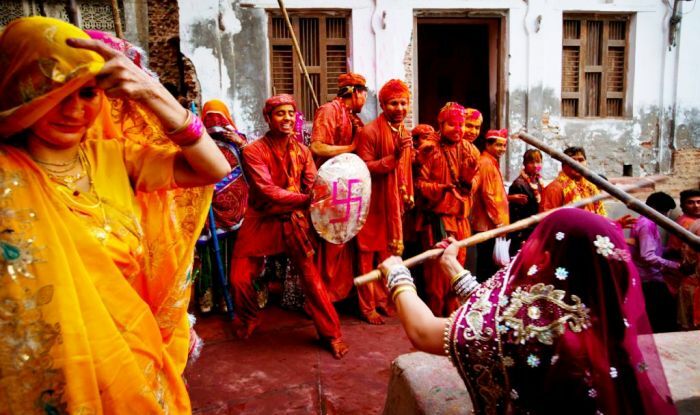 Lathmar Holi in Mathura is played at Radha Rani Temple, believed to be the birthplace of Radha Rani. Here, a playful ritual is conducted where women playfully hit the men with a big, round stuck known as ‘lath’. 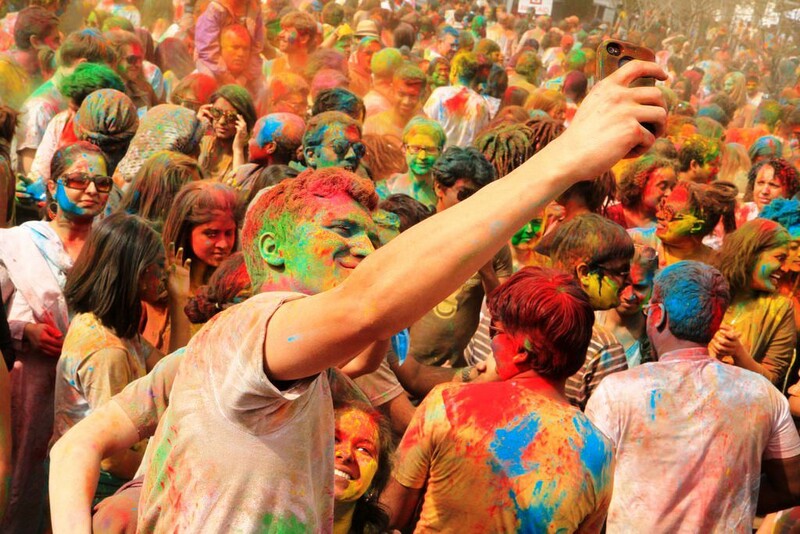 People who have been to Lathmaar Holi for once have never failed to praise about it. When it comes to Holi in Vrindavan, it is just heavenly these days. People from foreign lands also plan to visit India to experience this once in a lifetime. Colors, flowers, water, and music are added with beautiful boys and girls dressed as Radha – Krishna is so eyed soothing. There are more than 1000 temples depicting the love, generosity, and journey of Radha Krishna. The Banke Bihari temple has a whole week of celebration. The devotees visit to play Holi with Lord Krishna, while the priests of the temple join by splashing Gulaal and color to the devotees. Bhajans (hymns of God) in the background will take you into another world of eternal peace. If you wish to experience oneness with God, this should be a must on your checklist. You check the photos of Holi festival in Vrindavan & Mathura 2018 and you’ll start cringing about missing it already. Moving ahead, if you’ve dreamt of playing it on the banks of river or lake, Gulaal Kund is something you would love to visit. The energy during Holi events in Mathura and Vrindavan is radiated throughout the whole space. There’s a small half an hour celebration of Phoolon wali Holi in Vrindavan. But during this small period, everyone individually drenches their soul in the fragrance of love, devotion gratitude through those petals. With all these passing years, India has modernized and developed a lot. But the one thing which has been intact and unique is its festivals. Especially Holi is the festival of good over evil, festival of oneness, festival of love and equality, festival of acceptance. Celebrate your this Holi in Mathura and Vrindavan and explore it in its purest form with your loved ones and with new ones, Kyunki ‘Bura Na Mano Holi Hai’ (Don’t hold the grudge, it’s Holi).